When we started restoration work at Pleasant Valley Conservancy in 1997 (almost 20 years ago), most of our savanna areas with calcareous soils were solid buckthorn. I remember those days but could not find any photos that showed it. Recently, digging through boxes of photos from those pre-digital days, I ran across this delightful photo from 1985! I don't know the exact location, but I believe it is at the edge of the Unit 10 savanna. 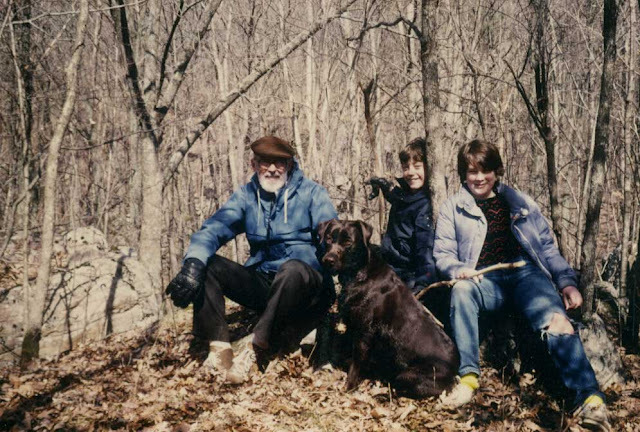 I remember that we climbed up to the top of the ridge and then, exhausted, sat down while Kathie took our picture. The dense buckthorn thicket behind us is typical of what was there before restoration. You could not walk through the area without bushwacking. After the leaves came out, you could not see the big trees inside of the savanna. I looked for a photo taken after restoration from a similar area. (Most of my digital photos have been indexed in Excel.) The one shown below is approximately the same site. Photo of Unit 10 savanna taken in October 2010. This savanna was cleared in 2001-2002. It has been burned annually ever since. At first it was hard to get the area to burn, but after a few years the new understory vegetation started to provide great fuel for burns. 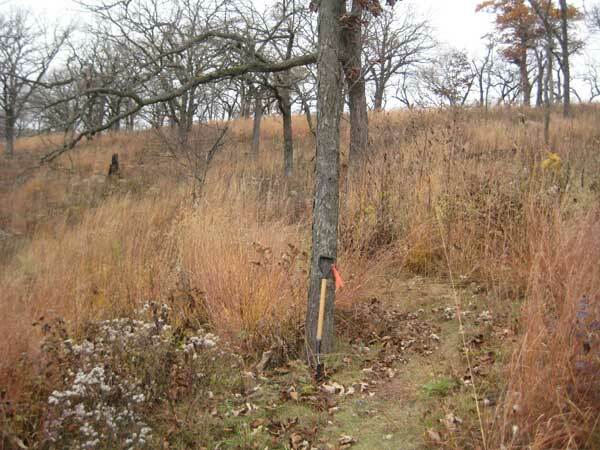 How did we get rid of all that buckthorn? Originally by basal bark treatment with Garlon 4 in oil. (We used to buy a Garlon 4 pre-mix product in 6 gallon pails.) Pat Schrader did most of the work. He set up 100-foot-wide swaths, starting at one edge of the unit and moving all the way through to the other edge. Most of this work was done in the winter. (In those days we had some mostly snow-free winters.) The following growing season the treated buckthorn did not leaf out. After two or three years, the dead roots rotted off and the plants could be easily pushed over by hand. They then provided a good base for a burn pile. I think this sort of basal bark treatment is the best way to get rid of buckthorn patches as dense as these. It is lots less time consuming than cutting and treating the cut stems with herbicide, providing you aren't in a hurry to get the area cleared. Just to be clear: getting rid of the big buckthorns did not get rid of the buckthorn! There was a seed bank, as well as lots of dormant buds on underground root collars, some of which resprouted years later. I discuss this phenomenon in a separate post. But with persistence we have now virtually eradicated buckthorn from our savannas! I’ve posted on this before but it doesn’t hurt to repeat it. Restoration work, especially of oak savannas, results in lots of downed timber. Although good logs can be turned into lumber, and less good logs into fire wood, there is always lots more woody biomass that ends up on piles. Some of these piles might be saved as critter habitat, but because they complicate controlled burns, most of them have to be eliminated by burning. In April 2000 Dane County did high resolution air photography of the whole county, and on the photo of our property every one of those burned spots can be seen and counted. There is a skill in building a good burn pile. The secret is to make the pile compact, which means cutting many of the smaller branches so that the wood can lie flat. The more compact the pile, the better it burns. A chain saw or lopper is essential when building a burn pile. 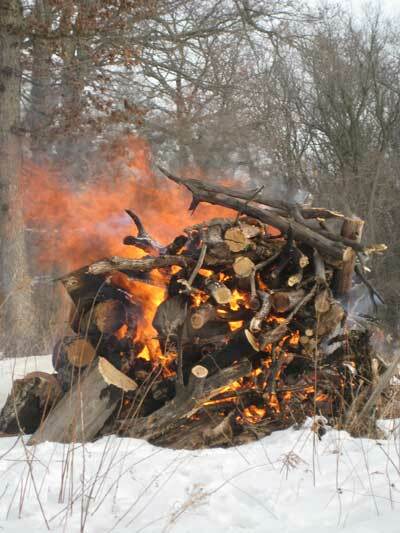 The best fuel to get a brush pile started is drip torch fuel (2 or 3 parts diesel to 1 part gasoline. The photo here shows a well-made brush pile at the early stages of the burn. If there is a lot of snow on top of the pile, it will probably burn better if the snow is blown away with a leaf blower. The best routine is to burn a lot of brush piles the same day. Get started early, as it will take all day to finish the job on each pile. Start all the piles in sequence and make sure the fire is going well at each pile before moving on to the next. Return to those lighted earliest after about an hour, and check on the fire. After lunch, return again, starting again at the pile lighted first. The watchword for the afternoon is “consolidate”. A good garden rake or shovel is best, and heavy leather gloves. There will be lots of unburned wood at the edge of each pile. Use the tool to lift them and throw them into the center of the burning pile. For smaller pieces, pick them up by hand and toss them into the center of the pile. Go around the whole periphery of the pile, and get everything back on to the pile. Continue around the circuit of piles, consolidating each one before moving to the next. At the end of the day the goal should be that all the wood is burned up, with only ashes left. 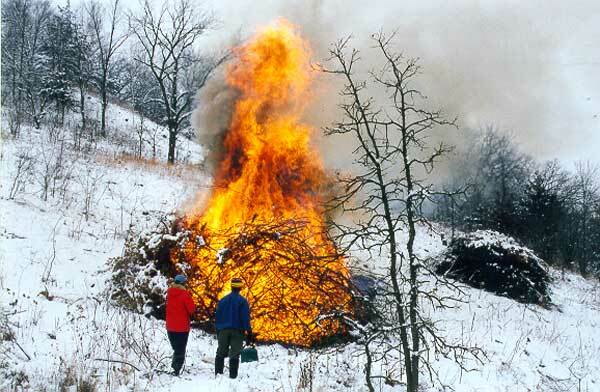 I’m often asked if burn piles don’t sterilize the soil underneath. The answer is yes, although soil is a poor conductor of heat, so it should only be a top thin layer that is sterilized. But the bare area should be planted with a good seed mix similar to that of the surrounding habitat. Blow away all the ashes with a leaf blower, leaving only bare soil. The planting can be done any time, although best in the winter so that the seeds have a chance to get stratified. Our experience is that even the end of the first growing season, you will hardly know where the burn pile was, and by the following year everything will be back to normal. Be sure to wear a fire-proof jacket, because a burning pile creates lots of sparks. You don’t need Nomex, but any old cloth jacket that won’t burn.